Where do I begin ..........!? The rain held off all day and the sold-out event started off with a record number of female athletes in the Half Marathon. 7 of the top 10 Half Marathon Finishers were women although Mark Lynch of Team H won comfortably in 1:23:03. First Lady (she didn't want to be called joint 2nd fella!) was Sophie Auster who crossed the line with her running club partner, Robert Harper, in an impressive 1:33:12. Highlights of Day 1 were many but a young man stole the show (again!). Even though we had Tyre Lady dragging that tyre with her for 26.2 miles, we had one of our regular characters - Mr Ben Lupton - running all 26.2 miles without a blind assist runner. If that isn't interesting enough, he brought everyone at the Finish HQ to tears when he smashed his Marathon PB by fifteen minutes with an incredible 4:57:59. The Full Marathon was won in an incredible two-man battle by James Blight of Tamar Trotters in 3:16:26 who pipped Tom Murrin by 7 seconds !! First Lady was Debbie Burman in 3:55:40, who also holds our "aggregate 2 day record". What an historic occasion for us at firstandlastrunning with Roger Voaden finishing his second consecutive day with us for his 100th Marathon and with Ruth Benzimra increasing her UK record to an incredible 600th Marathon. We ate far too much cake and we enjoyed staying out late to see Tyre Lady and Superman home. We really do enjoy these events and perhaps we should add "Characters are Welcome !" on the online entries pages. Roger came home with his pals from Okehampton RC (Jeremy Tandy, Andrew Vallance & Robert Kelly) in an impressive second day timing of 3:22:44, a full 1 minute slower than he managed on Day 1 !! Allen Taylor, of Teignbridge Trotters, ran a very quick 3:06:36 to take the title and was followed by Matthew Dalton who ran a 30 minute PB for the Runners Up place with 3:09:48 (that would normally win Matthew. sorry !). First Lady was Jane Hemsworth with 4:21:34, who spent all day chasing Sarah Hillson until she finally overtook at the Bickleigh Aid Station. In the Half Marathon, Men's Winner was Andrew Vernon in 1:29:47 which rounded off a very successful day for Okehampton RC. First Lady was Alison Caldwell of Plymouth Muskateers in 1:51:40. All the winners, male and female, from all four races were from Devon. Well, nearly. Seven from Devon and one from just over the Tamar Bridge in Saltash. I have no idea how we can beat all that at our next event in the 2019 PLYM TRAIL SERIES in May. The course is a quick 1.58 mile 'out and back' in Clearbrook village followed by a 12.31 miles 'out-and-back' run on the well-signposted Cycle Route 27 which is completed twice and will be well marshalled. Toilets and refreshments will be situated at the Race HQ near the Start/Finish Line and at the turnaround point at Coypool. Another refreshment station will be manned near Bickleigh Barracks which is situated approximately halfway between Clearbrook and the turnaround point at Coypool. At Coypool you must show your Running Number or you will not be recorded as having run the full Marathon distance ! Here comes the rules .............All Athletes must be atleast 17 years old, 6.5 hours cut off, DQ for littering or failing to follow instructions from Marshalls, Running Numbers visible at all times, Stay on Cycle Path 27, Share the Trail with Wildlife and other people and dont upset anyone. We would like to give special thanks to Wayne The Tyre Man, Stephen Cunnington, Tim Lupton, Karen Draper, Martin Stedman and Clearbrook Village Community for all their behind-the-scenes assistance. "So glad I chose this event for my 100th marathon !" ​ Roger Voaden. The clearest, easy to read and informative pre race email I have ever received. It makes a huge difference when travelling to an area that you are not familiar with." Clare Rogers. "....my first race here - felt as is I had been attending these events for years." Lesley Whitehall. "A positive buzz all day !" Jonathan Shepherd. "Wow ! Great venue and I enjoyed the whole day. So good that I signed up for all the other weekends as soon as I got home !" Kathy Perry. "I signed up for every race in the 2018 Plym Trail Series and look forward to it every time !". Stephen Boyes. "Amazing new series of medals and and a lovely atmosphere all day. Great value for money event and a lovely cup of tea in the Village Hall before and after the race was a nice touch as well. We will be back again soon !" Ann Pontefract & Jackie Wiggins. "What an amazing way to spend your 50th birthday !" Dawn Howles. 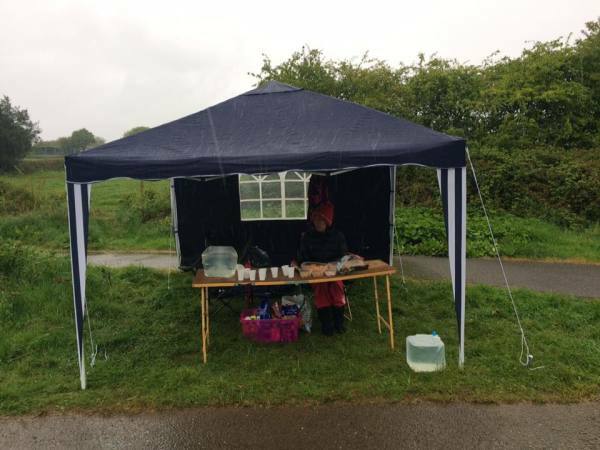 "......firstandlastrunning did a great job of organising, supporting and providing fuel on a pleasurable yomp........ Good, low key, great value event, cheers guys !" Carl Miles. "Another great weekend on the Plym Trail with a fantastic medal and great camerarderie and atmosphere as always." Sarah Salt. "Thanks to all the organisers, Marshalls and fellow athletes...... one of the friendliest races around but a chair lift at mile 25 would be appreciated !" Paul Caulfield. 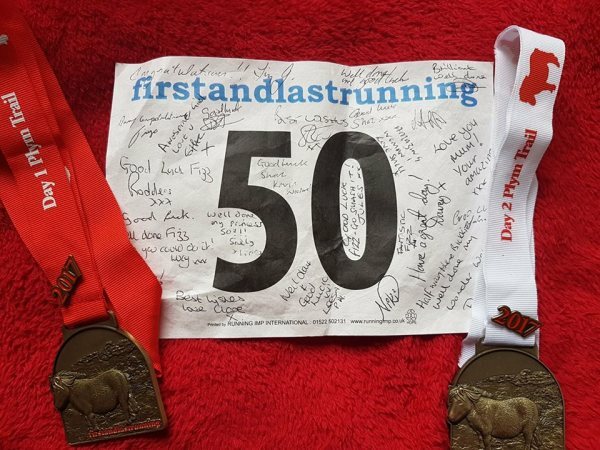 "....they made me feel instantly welcome when I turned up this morning at Dartmoor to run, I was surrounded by some seriously tough experienced runners but Davey blew that feeling away very quickly and was chatting to me and the other runners very quickly." Darren Philip. "When is the next one !!??" Sharon & Robert Hooper. "I just could not think of anywhere else I would rather be today !" Paul Nolan. "A great,well marshalled, and beautiful course. One of the best kept secrets on the Marathon circuit......." Paul Allen (over 300 Marathons). "Definitely in my top 10 of great courses !" Alan Littlejohns (over 100 Marathons). "Great fun loving Marshalls and a lovely course!" Lorna Mulvihill. "You simply will not find better value for your money at any other Marathon event !" Andy Easton. "Where else do you want to be on wet weekend !?" Rod & Lucy Payne.